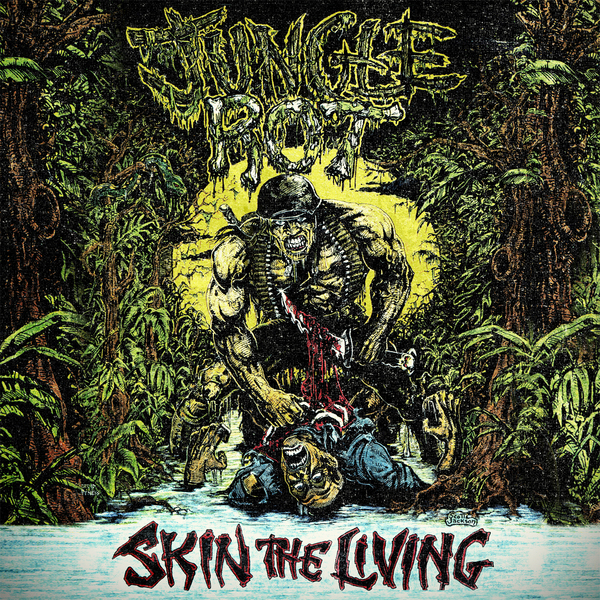 Fans of old school death metal are going to want to pick up JUNGLE ROT’S re-issue of their first album, Skin the Living. For those not familiar with the Kenosha, Wisconsin band, they play standard but reliably good death metal that stays true to the genre’s sound in the early to mid-90’s. Skin the Living is packed with chainsaw guitars, double bass drumming and guttural vocals and, at 25 minutes in length, the album isn’t long and drawn out. Lyrically, the songs all deal with what you’d expect – horror, death, decay, murder and Satan. JUNGLE ROT have been around for a while and are worth checking out if you’ve never heard them before. This re-issue is a nice place to start and it sounds great thanks to a re-mastering job. If you dig this, the band plans to follow up with an album of brand new material later this year as well. So 2013 looks to be a good year for JUNGLE ROT fans.